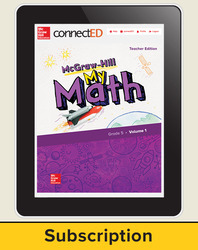 The online Teacher Center offers easy access to all digital resources, including an online version of the Teacher Edition. You can organize resources based on the Mathematical Standards to personalize lesson planning, instruction, and differentiated instruction. Create custom lesson plans, organize lessons in any order, and post assignments online. Includes: Problem of the Day, Quick Check, English Language Learners Guide, Strategic Intervention Guide, Diagnostic and Placement Tests, and Assessment.